708 Fulton. Strange, that name. Having received an urgent call from an oddly familiar voice to meet there, Douglas entered. 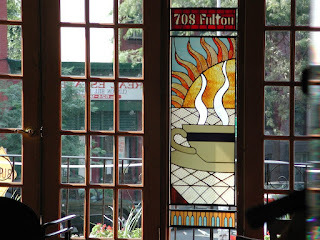 It turned out to be a small but comfortable coffee shop boasting a stained glass image of the sun rising behind a cup of hot coffee, seemingly symbolic of one of the few things in life George truly enjoyed. As he sipped, George felt 708 Fulton to be a place of respite from his inadequacies, failed dreams, and the entire cold godless universe. "Never heard of this place before," he said to a passing barista. "Little wonder, my friend. 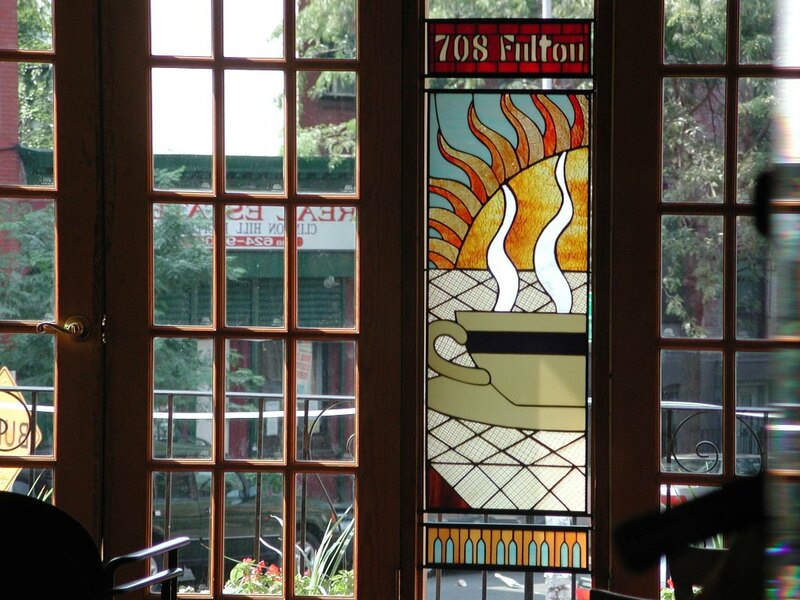 708 Fulton is heaven, dude." And the universe was no longer cold for one Douglas Fulton Smith. I came in at 123 words this week, not too shabby but still off the mark. We'll see what the new year brings. This is really good, Perry. I thought you were being a bit heavy with the Cold Godless Universe thing for poor George, but the last line makes up. This is one of those stories that unfolds with each new line. Yep, "cold, godless universe" could be somewhat of a cliche. In general, I fall over myself a bit when I try to write quasi-seriously because I'm really most comfortable with humor, but it's fun to take a crack at it every now and then. I'll forgive you for "cold godless universe". You redeemed yourself with the stellar ending. Thanks for your kind comments on mine. Funny. I'm usually the class clown in my social circles but I rarely write humor. Go figure. This story was a deftly written tale and one of your best, for me. A perfect ending to Douglas Fulton Smith's life. I loved the way you wove the name into the warp and woof of the tapestry. Loved the mood you set and the mystery you spread before us and then solved so supremely. That's it, bud. All out of compliments......but you deserve more. Second one in a row I haven't understood - must be the atlantic divide. :( I did however enjoy the change in style; you should do this more often. Nice work. Well, of course, the views of my characters don't always necessarily reflect mine, but at least for now Douglas' conflicts work out nicely. Thanks for you comment about the ending, and go crack up that class! Thanks, Douglas. Huh, that's the name of the character. Not intentional. I have two problems with the piece. It's a bit like a fair to middling Twilight Zone --- a good ending but not one of the most original. And I don't like the word "featuring" in the second paragraph. Should be stronger. But if I deserve more, bring it on! I never felt so isolated from the mother country! I'll strive to close the cap in further posts. Thanks for writing, Sandra! Good job!! I think all the kudos have been handed out, so just re-read them when you're done with my comment and have someone else pat you on the back so you don't risk breaking your arm. :-) Have a happy new year. I didn't quite follow all of it. I liked the style and I liked the heaven angle - that's very unique. Well if this is heaven I hope the guy is right and it is different for everyone....Cause I am thinking more along the lines of a nice cabaret. I did enjoy this style. Good job. I was actually thinking of a particular Twilight Zone, Perry but refrained from referencing it because of my tendency to do that. (Sue me, I own the definitive box set) However, since you brought it up. It reminded me of a particular episode with Sebastian Cabot as the death angel. I hope heaven comes with free refills, or at least takes credit cards. A fine story. Have a great new year. well thought out. I could see heaven as a coffee shop. I've always said my idea of hell would be a math class, followed for a foreign language class, followed by a day long trip to the amusement park. Sure, that was the dyed white-bearded Sebastian Cabot in "A Nice Place to Visit," also starring Larry Blyden. Actually it reminds me more of "A Stop at Willoughby," especially with the tie-in of Douglas' middle name to his ultimate destination. Kudos? Sounds like something you didn't want to have in high school. Thanks for writing, Janet, & Happy New Year! No. Just booze disguised as coffee. It is my idea of heaven, after all. And wish you an even splendider one! No, don't expect Fulton Sheen any time soon. Charlie Sheen, maybe. Is that unserious enough for you? I am thinking more along the lines of beachfront property, maybe with a nice coffee place nearby. Wherever, have a good new year! I believe they do take Aftercard. Math class would be hell enough for every unrepentant Nazi on the planet! I imagine a coffee shop would be good to have in heaven. Great piece. As long as it's cheaper than Starbucks! That Cold Godless Universe part touched my heart.